BAHAWALPUR (92 News) – In another incident of outrageous cruelty of landlords, brother and nephew of Punjab MPA Khalid Jajja killed a peasant over a land dispute at Chak 353-HR on Sunday. As per reports, the victim Allah baksh was on his way to the culprits – Rashid Jajja and Muhammad Dilshad – to show them the court’s stay order when the two sprayed bullets at him, killing him on the spot. The police registered an FIR against the accused. However, the culprits could not be arrested as yet. 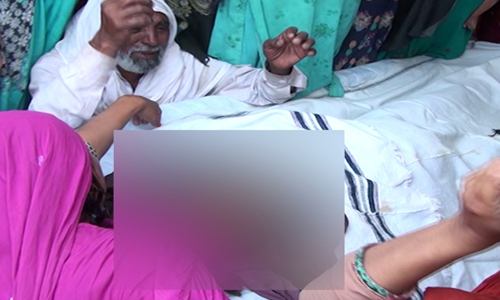 The victim’s relatives staged a protest as they placed the dead-body in front of the Bahawalpur Press Club demanding immediate arrest of the suspects. “We want the Punjab chief minister Shahbaz Sharif to take notice of the incident,” a protester said. This is not the first time that relatives of influential landlords killed innocent people. On April 1, an ex-minister’s son shot and killed a 14-year-old under the influence of alcohol in Lahore in an outrageous display of disregard for law.